Margarethe von Trotta, Hannah Arendt (2013). Does an unvarnished truth exist? And, if so, does it intersect, even slightly, with what one might call good? Those questions are at the core of Margarethe von Trotta’s Hannah Arendt, a heady film that is only superficially a biopic of the famed political thinker, “Martin Heidegger’s favorite student” and one-time lover, the first woman hired to teach at Princeton. Arendt has opened in New York and Los Angeles, after having been nominated for and won a number of awards, in Middle and Eastern Europe, including two German best actress nods for Barbara Sukowa as Arendt. Although the film has flashbacks to Arendt’s days as a student in Marburg, von Trotta focuses on the few short years of Arendt’s career in America after the capture of Adolph Eichmann, whose trial she “covered” for The New Yorker, resulting in a series of articles published in book form as Eichmann in Jerusalem: A Report on the Banality of Evil. The drama of the film itself occurs not in the capture of Eichmann, which happens in the first 30 seconds, nor in Arendt’s relationship with Heidegger, nor even in the trial itself – though this may well be the heart of the movie – but in the revulsion with which Arendt’s reporting is met by her closest friends at Princeton, in New York, and especially in Israel. Arendt, who fled to Paris as the Nazis came to power, was briefly interned in a French concentration camp at Gurs near the Spanish border, from which she escaped and eventually made her way to the US. Alluded to but not represented in the film itself (which is more than can be said for much of her writing, her work with Karl Jaspers, her friendship with Walter Benjamin, her first marriage, or her work in Germany after the war), von Trotta presents Arendt as wanting to understand this ultimate evil by staring it in the eye. Her friends among the US exiles are wary of her trip to Jerusalem to report on the trial for a readership that cannot be expected to comprehend their experiences of horror, a sharp contrast to the almost boyish enthusiasm of New Yorker editor William Shawn (portrayed by Nicholas Woodeson doing everything he can to mimic Wallace Shawn, who might have been better cast to portray his father). Her husband thinks the trial itself is a travesty of justice. In Israel, her friends are frank about the political nature of the prosecution. Israel, she is told, needs myths. Arendt arrives half-expecting to find a monster on the dock in the glass cage built to protect Eichmann during the trial, but finds only a weasel, a logistics bureaucrat with a permanent smirk across his face. The moment of brilliance in this film is von Trotta’s decision to let the audience see just what Arendt did. 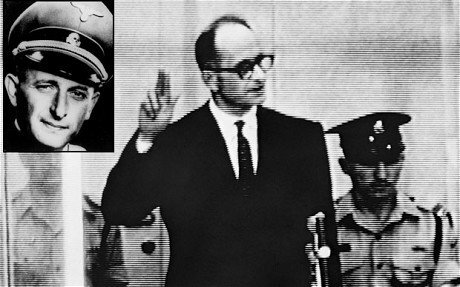 Archival footage of Eichmann and the trial are liberally interspersed with the reaction shots of the world press trying to file articles under deadline. In dramatic contrast to Eichmann, who claims he was only following orders and that to follow orders in a time of war is the highest duty of any man, even that he has no hatred of Jews, he was simply doing his job to the best of his ability and his job was to ensure that trains filled with Jews arrived at the camps, we see testimony from many of his accusers, overwhelmed and destroyed by their experiences, throwing themselves on the floor of the courtroom, unable to continue, spectators equally unable to contain themselves, calling out in court, cursing the defendant. None of this is done via reenactments. Arendt’s reaction is a curious one. If she has any connection to the emotional devastation of the victims, she doesn’t show it – later in the film she will say point-blank that she does not love the Israeli people, that one does not love “a people,” one loves individuals as she does her friends. Arendt however is fascinated by the fact that she believes Eichmann is completely serious when he says that he is not guilty, that he was only following orders. Evil flows simply from the willingness to do one’s job, to be honest and efficient, even trustworthy. It is not the individual who does evil so much as it is the whole system once that system has gone bonkers. Which must mean that anyone implicated in the system equally bears the blame, whether it is the man who saw that the trains were full when they arrived at Auschwitz and Dachau, or the Nazi-appointed Jewish leaders of the various ghettos, such as Chaim Rumkowski of Łódƶ. Even though someone like Rumkowski, who voluntarily boarded his own family on the last train to Auschwitz, may have been killed by the other inmates on his arrival, suggesting that there were Jews complicit in the Shoah generates a visceral reaction. 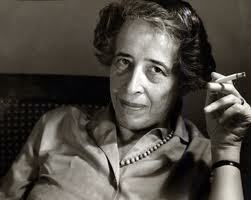 Arendt is rejected by many of her friends. Mossad sends agents who demand that she not publish the work in book form. Her colleagues at Princeton want to strip her of her classes. Norman Podhoretz is snarky and mindless. Which leads to a Big Final Scene in which Arendt addresses the community in a lecture hall, tying the picture into too procedural a bow as a lone female stands in for the film audience watching Arendt hold her ground, looking worried when Arendt is attacked, happier when Arendt parries a verbal assault. In film cliché terms, Arendt is good, but she’s not Atticus Finch. 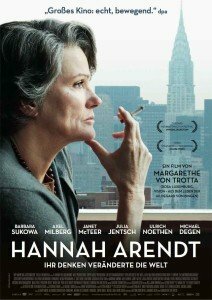 Hannah Arendt is almost a great motion picture because it raises profound issues and for the most part leaves them there out front for all to see. It is impossible to view this movie without contemplating what the true cost of Israel’s founding myths might be for everyone in that region of the world, how the pillaging of communities and expulsion of a population to a destiny in camps can be viewed as anything other than the most obscene of ironies, but not something that anybody raised in a nation predicated on the genocide of several already existing native nations can project any political or ethical superiority about. There is plenty of blood for everyone’s hands here. Von Trotta, a German filmmaker living in Paris, is not unmindful of the broader implications. So it is impossible to view this movie in 2013 without thinking of the pending prosecution of Dhokhar Tsarnaev, the so-called Marathon bomber, who not only may have been led into his act in Boston by a violent and manipulative older brother, but who never even thought about the need to get away. How separate him from the politicians who choose to conduct war via unmanned aircraft, conduct foreign policy by proxy through comprador regimes everywhere in the world, and execute their plans via technicians who go home at night to their families in places like Denver? There is never a drone strike anywhere in this world that doesn’t hit home in America at the same time. It’s not like we haven’t given wannabe jihadi more than a few reasons to be pissed. One could argue that only a purist of fundamentalist dimensions might opt out of such a system, but remember that Ralph Nader gave us George W Bush. Perhaps it’s not the banality of evil so much as its ubiquity. In Arendt, the key figure in the question of complicity isn’t Adolph Eichmann at all, but rather Martin Heidegger, who as a brilliant professor in his late 30s seduced (or was seduced by) a young woman 17 years his junior. Von Trotta emphasize Heidegger’s opportunistic sexual abuse by choosing an actor for the role who is in fact in his 60s, but she is more reticent in articulating a position on young Hannah Arendt’s actions as student-seductress, going to her professor to ask him to teach her how to think (one of the great come hither lines of all time, that), inviting him up into her room. The film is quite frank that the exiles around New York never have been particularly monogamous. Arendt’s husband spends the night with one of his students at Bard, but is still portrayed as loving and loyal. Arendt chastises Mary McCarthy for characterizing her fourth husband James West as a “good man,” unlike every male character in McCarthy’s own books. Everyone in their circle already seems to know about Hannah and Martin, some are even said to be jealous. And Arendt is seen chastising Heidegger post-War for his snuggling up to the Nazis, telling him that his actions made her sick even as he blathers on — imagine Heidegger blathering – about his continuing love for her. Von Trotta isn’t making a case about the slippery slope of moral relativity. The emotional damage of the Holocaust remains pretty much in black-and-white. There is no documentary footage of backhoes pulling up hundreds of skeletal corpses from mass graves. There is no scene where Arendt mourns that failure of Walter Benjamin to make it over the border into Spain. Von Trotta seems very much to buy Arendt’s argument that one can’t love an abstraction, even if one can kill for one. Heidegger was an opportunist, an instance of very small thinking indeed. Whether Arendt was one also, even if in a contrarian mode, von Trotta leaves pretty much for the viewer to decide. Ron Silliman is an American poet, the author of many books, and a cultural blogger, who lives in Chester County, Pennsylvania. His Silliman's blog can be found at ronsilliman.blogspot.com.